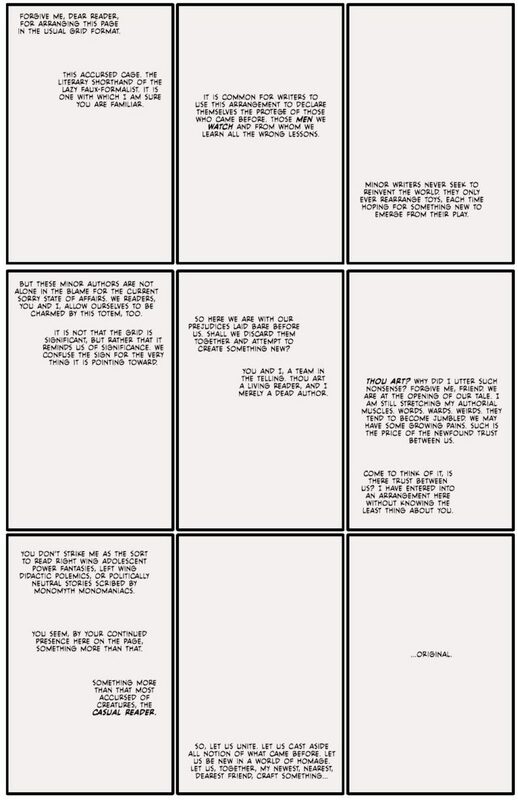 Do I Hate the Nine-Panel Grid or Do I Just Resent Watchmen? What bothers me about the nine-panel grid is the sense of “being told to.” Someone is telling me this is happening, specifically, like this. I am being asked to sit still, with my hands in my lap, while the teacher talks, and I feel there is no facility for imagination. But this is muddied by the primary source of admiration for the grid. 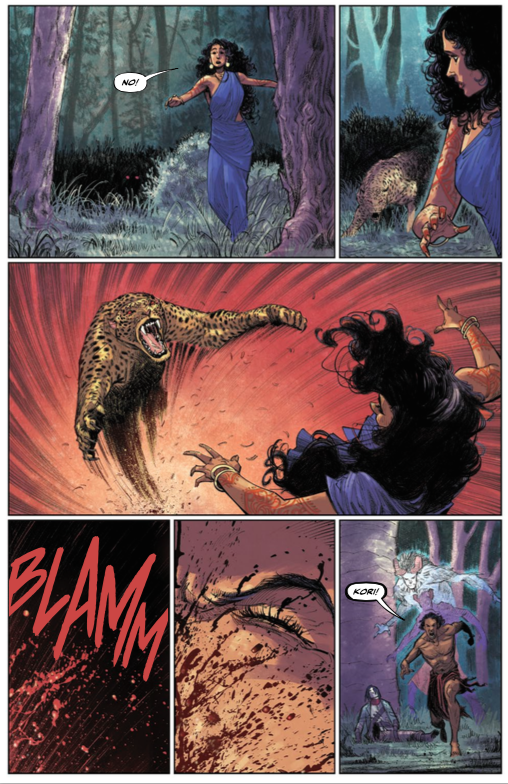 Morrison mentions it obliquely in the most recent spurt of Moore-based criticism: Watchmen, the evergreen paragon of nine-panel, feels like “you can’t turn the page without him saying ‘Look at me, look at me, look at me.’” There are aspects of the book which Morrison may be speaking to other than the grid, but this is how Watchmen’s layouts register to me. As a grind. The author (gestalt; Moore-Gibbons-Higgins, though bless bless Higgins, as he tried hard to save me with that glorious palette) is present, beside me, turning the page (which I’m not allowed to touch) when he feels inclined to, giving out details like Mary Poppins doles out growth. Reading Watchmen in trade is a drag because the rhythm of it is so regular, for whole issues; for twelve whole issues. Repeat your nine times tables, again, please, Claire. Noooo. I’m bored, sir! Fearscape (Vault, 2018) begins with a nine-panel grid that addresses itself—you know it is there, and it tells you it is there, a classic lampshade. Thematically this is appropriate, because Henry Henry is “the writer” of this comic, the visible voice, a man who does his best to misrepresent himself positively. But of course he’s a made up person within the narrative, no matter how much he claims to be without it. 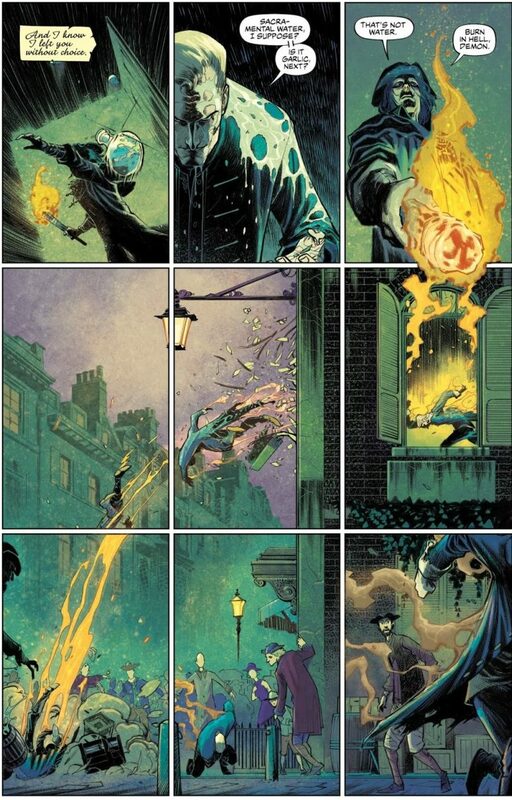 Fearscape uses the nine-panel grid to introduce itself as story about narrators that works intensely hard to hide it’s genesis; a metanarrative to disguise one, or to distance itself from the practical meaning of metanarrative. The author (gestalt; O’Sullivan-Mutti-Popov-Andworld) does not continue to use regularly sized panels, as a rule; the grid did its work, and was discarded. The decision is made on the grounds of which feels the least boring, as there is no benefit of interest to taking either route. To a reader unsure of “how” to read a comic book, no help is at hand. 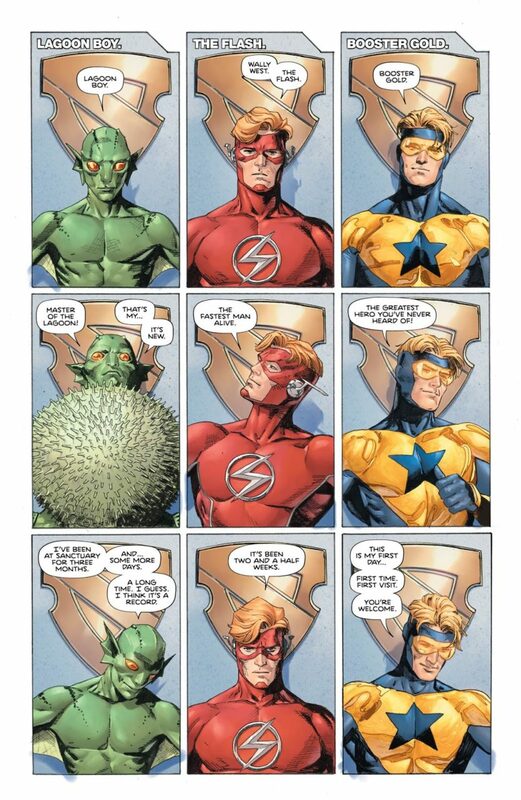 On the last page, there are simply nine panels containing nine characters giving the name/addendum/time rote answer, underneath introductory caption text which lists their name. The grid means repetition, extraneous information, and boredom. 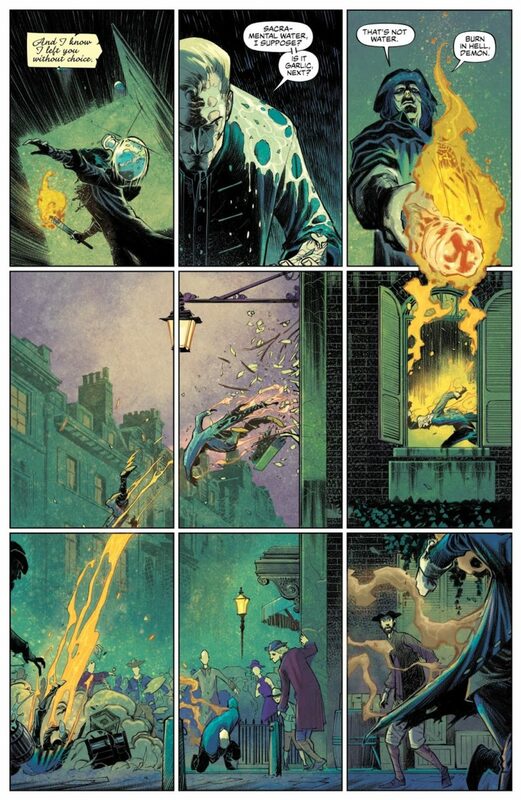 The repetition of introduction serves to anonymise the characters, and the change from three panels each to one panel each within the same layout template implies “mounting numbers” or “increasing speed”—the impression is that these are characters lost in a massacre; murder, kill, death. The grid is used to say “there were a lot of superheroes living with life-derailing trauma, and now there are a lot of dead superheroes. Either way, probably too many to really care about individually.” I do not enjoy this, or appreciate it, although I perceive it to be an accurate description of the author’s attitude. This naked use of the grid does not lampshade itself, it does the opposite: it appears to light up the individual using it with a bare, bright bulb. 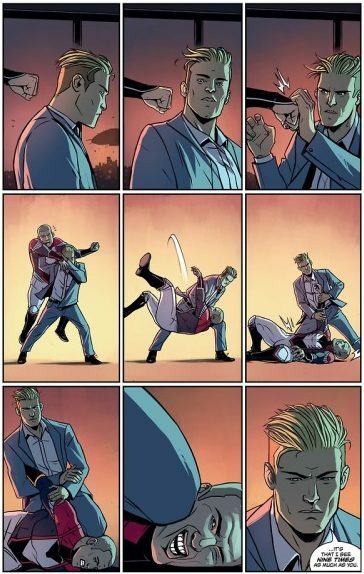 It’s rough that you feel bad about being in the CIA, Tom King, but I don’t think this is the way to carry on. 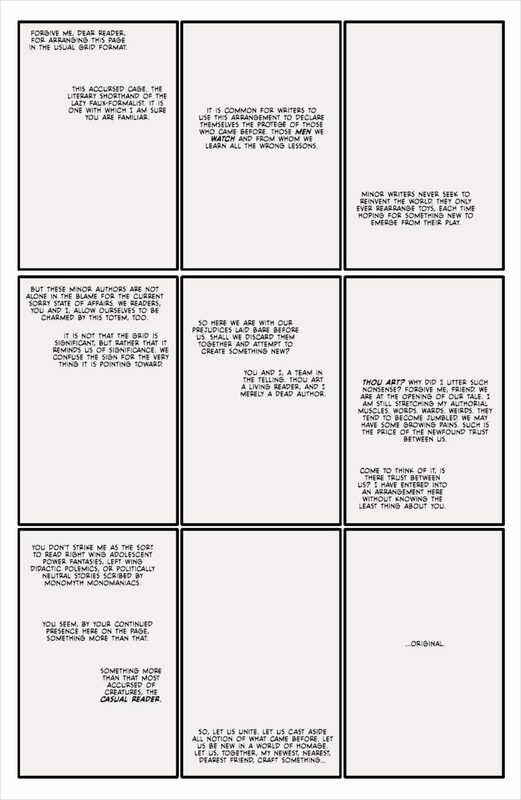 Peter Cannon, Thunderbolt (Dynamite, 2019) uses its first full nine-panel page (though its layouts are based on the grid throughout) to literalise the narrative caption in which Cannon claims to be “nine times better” as well as to actualise the connection the character has with Watchmen: Cannon was the inspo for the knockoff Adrian Veidt, and Peter Cannon, Thunderbolt begins with “an entire city, dead” (which is how Watchmen ends). 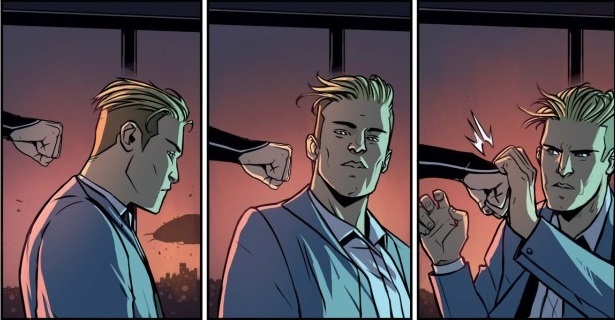 In a page which embraces the grid that Watchmen is the peer-voted representative for, Gillen is bold enough to use words which amount to “I’m better”—not a rude challenge or absolute claim, but a wrestler’s taunt before a match between equals. It’s certainly appropriate to promise to do one’s best to try to outdo a thirty year old product of shared foundations, and this page is so absolutely formal it’s almost an animatic. This-is-what’s-happening-on-this-page-see? It is definitely the author (gestalt; Gillen-Wijngaard-Safro-Otsmane-Elhaou) taking a moment to look out of the moment and say “Hey. Pal. I see you reading. Watch me do this.” It’s a perfectly executed expression of confidence. 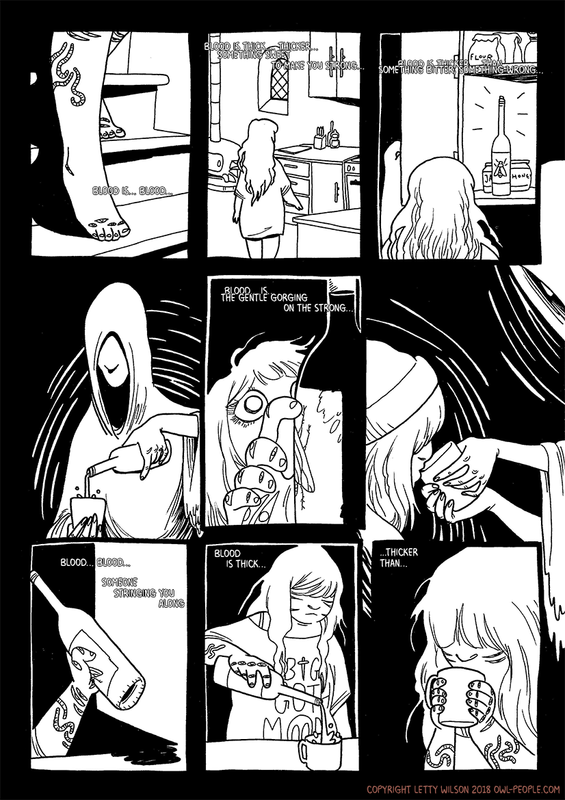 Letty Wilson’s How to Make a God (independent webcomic, 2018) uses a nine-panel grid on this page to propagate the sense of outside-control that the author-grid creates. Inevitability and the distressing nature of not being quite sure what you yourself are doing, but finding that you’re doing it anyway, are quite clearly diegetic. 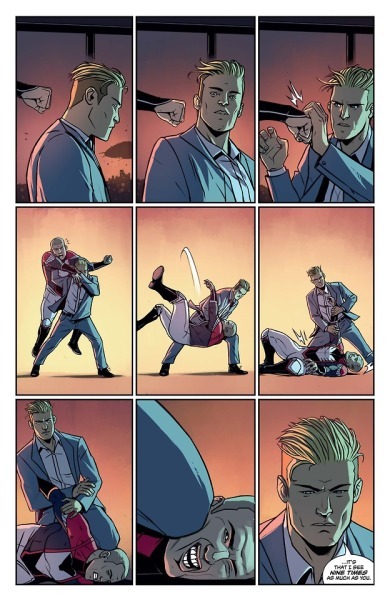 Other pages use panel arrangements of all sorts—this one is 3×3 because this is the one on which the protagonist is moving on rails: being moved, not acting with agency. The reader perceives it because they are aware, consciously or subconsciously, of how their experience is suddenly being marched along, in contrast to the previous and subsequent pages. These Savage Shores (Vault, 2018) uses the grid as its layout template throughout, and is not disagreeable about it at all. This formal narrative control is immediately appropriate when considering the metanarrative that lies entirely outside the pages: An Indian author (gestalt; V-Kumar-Astone-Bidikar) is telling a story about the East India company (and therefore about English colonial exploitation of India). They are telling it in English. Their control of this story should be visible, it should be unassailable; it should be complete. Sovereignty of voice is elementary, and the grid is made for the purpose. The grid also works for this story because it’s basic sterility means there’s no extra effort necessary to express the chill of either of the two white, colonial “protagonists” who open issues one and two. Though one is a vampire and one is a vampire hunter, both are introduced through largely silent gesture and letter-form narrative caption, that steady gridded rhythm regulating their impact on us and mixing with the unfriendly body language of the aristocracy, stopping us from growing fond of them out of habit, while the quality of Kumar’s drawing, Astone’s colours, Ram V’s character monologue and Bidikar’s lettering each make the quality of the reading experience high enough to ensure its audience’s sustained attention. For example, the terrific inventiveness of this page, wherein the chill air is obvious and the rigid rectangularity of each panel, the aligned nature of the gutters, allow the eye to be directed backwards and forwards again across the page without any confusion at all. The fondness is attached to the story, not to the miserable and isolated character—once the Indian characters, and all their personal connections, their vital interactions and emotionally present dialogue, arrive on the page, that fondness is allowed to burst into full bloom as we appreciate these people and their appreciation of one another. The warmth is emphasised in contrast to the opening chill—it’s created without needing the rhythm of the grid to be removed, because the stoicism of the grid itself has been lampshaded by the coldness of the Establishment it was grounded with. We’ve grown used to it, and because we associate it with unpleasant people who are now gone, part of its trying nature seems to have been alleviated. When the various characters cross paths with one another, their natures have been established well enough that they remain whilst sharing the same spreads and environmental colours. These Savage Shores’ Mortal/Immortal love story between Kori the dancer and Bishan the … bodyguard is also well-served by the authorial choice of the grid. Such a melodramatic relationship can be expected to run unevenly, and indeed it contains some imbalance which runs hither and thither, but the bam/bam/bam discipline of visual delivery makes it impossible for the soap to become opera. Their emotions cannot run wild, because the structure of their on-page existence does not allow for it—this requires the nature of their love story to be unusual where it should be cliche. The author cannot do what is expectable, and so he has the blank cheque to do something new. The quality of this storytelling is so high that my strong suggestion is to experience it in monthly issues (only two issues are out thus far), lest the collected series lose a portion of their power with the inescapability of that rhythm. 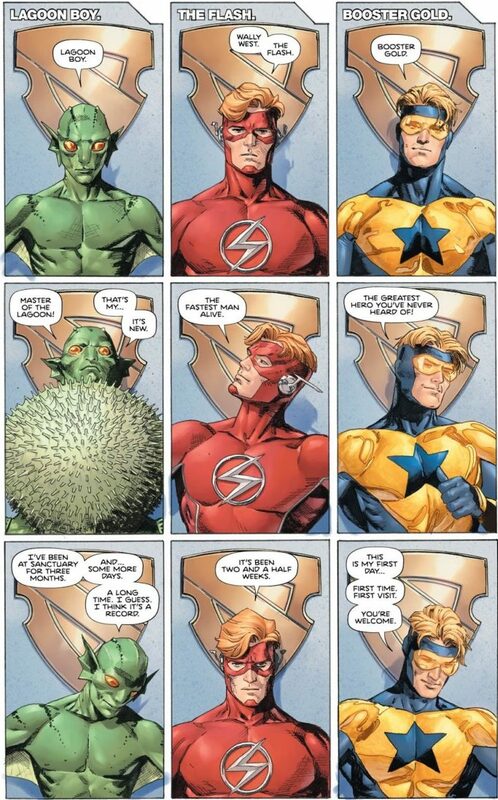 For this monthly comic book, the nine-panel beat is perfect. For more opportunity to think about this matter, try Mother Panic, West Coast Avengers, There’s Nothing There, Seeds, Eternal Witchcraft from POMEgranate Magazine, the assorted works of Alex DeCampi, and Jenny Robbins’ upcoming GN Biscuits. It’s good to learn what you really think about a tool upheld as the greatest.